There’s a Tesla storm brewing between Tesla CEO Elon Musk and the New York Times. Here’s some reading to get you started. John M. Broder, writing for the New York Times, chronicled a trip in the Tesla Model S. And, as you will read, he had “creeping range anxiety.” The company’s stock did not so so well today, according to this San Jose Mercury News story. Let me know your thoughts on this. I have never driven a Tesla, but having been in the passenger’s seat of my husband’s Leaf, I find nothing surprising in the Times story. The Leaf does not perform as well in cold weather and we have yet to get a full 100 miles out of a charge as advertised. Obviously, I cannot know whether the writer was not supposed to take a detour through Manhattan. And if indeed he drove over the speed limit, he would not get as many miles out of his charge. The Leaf rewards slower driving, even if its terrific acceleration tempts you to drive fast . The other day I ran errands with the Leaf, and it was the first time I saw the range-o-meter hardly budge. The car loves low speeds around town. But driving on freeways at East Coast winter temperatures would certainly cut into its range, I believe. The emergency brake not releasing without battery power was a new one for me. 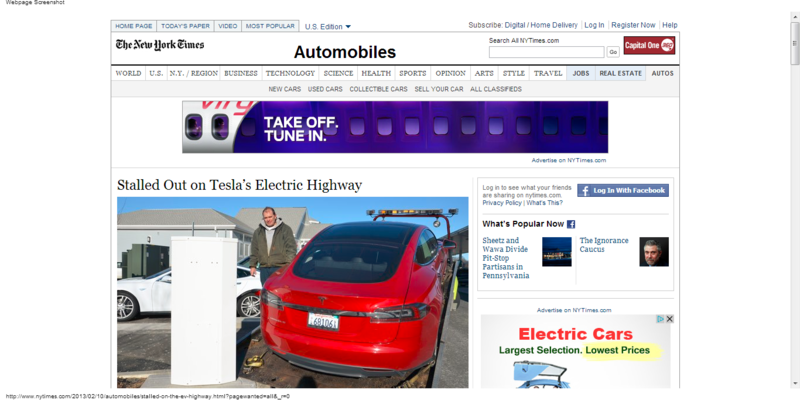 Did the writer from the Times really use all the Tesla’s charge? Would that happen with the Leaf? I guess I hope I never find out. EVs are imperfect. We all know that. Still, people like my husband have chosen to drive them with the hope that they will get better as each year passes. And, pioneers like Elon Musk are betting on the future of them. Still, driving an EV is not the same as driving a gas-fueled vehicle, and that is both good and bad. The question I would ask is whether the reporter adequately covered the positive with the negative. Cold weather DOES affect batteries, whether they be LI or LA types…..my Kandi has 21 miles range at 32 degrees, and about 45 miles at 50 degrees -plus….. Obviously this article was written with an agenda in mind. It seems that Elon Musk is implying that his Tesla batteries are not impacted by the cold. Does that make sense? I’m not so sure there was an agenda in mind, as much as it was simple lack of knowledge on battery performance. It seems to me that the current state of battery technology and the general publics lack of knowledge of battery performance are two strikes against EVs. Add lack of infrastructure and thats the ball game… Give it a few years of development (battery and infrastructure) to make up for the lack of planning and knowledge of the general public and I think we’ll see a much better EV. I agree. There is a disconnect between EV drivers and the rest of the world. Thanks for writing.